Hindu God Ganesha Statue is the Lord of success and destroyer of evils and obstacles.Lord Ganesha Statue is known to Bring prosperity and happiness in your home & Office. He is also worshipped as the god of education, knowledge, wisdom and wealth. Ganesh Sculpture can certainly be used for good Fengshui. Lakshmi is the Hindu goddess of wealth, fortune, and prosperity (both material and spiritual), as well as the embodiment of beauty. Lakshmi name is derived from Sanskrit root words for knowing the goal and understanding the objective. 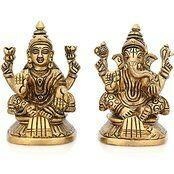 Size : 3 Inches Height X 2 Inches wide X 1.5 Inches depth, Weight : 1/2 Kg, Material : Brass, Features Of Laxmi & Ganesha : - Made from Quality Brass and Handmade in India.